The TOP TWELVE new STAR TREK: DISCOVERY title sequences created by FANS! STAR TREK: DISCOVERY broke with tradition to give fans an odd montage of seemingly random images—a drafting sketch of the USS Discovery, the Victoria Crater of Mars, a human nose/mouth/neck, a close-up on a human eye, an EVA-suit, a phaser, a communicator, a Vulcan salute, a Klingon blade, a weird giant plant spitting out the Discovery, a grappling hook, two space-gloved hands reminiscent of the iconic “The Creation of Adam” biblical fresco by Michelangelo, and finally the logo for the series and a fly-by of the USS Discovery again. But no space (the final frontier). The music is an eerie-sounding composition that transitions into a sometimes driving, sometimes mournful orchestral piece culminating in the familiar opening melody of the original Alexander Courage Star Trek theme. Composed by Jeff Russo, the Discovery music combines with the visuals to create an intensely surreal impression similar to the opening title sequence of the series Westworld. 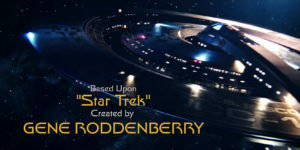 Like the series itself, people seem to either love or hate the opening title sequence for Star Trek: Discovery…just as they did for the “Faith of the Heart” opening for Star Trek: Enterprise. But Enterprise was canceled before YouTube existed (or rather, just as it was being launched). Now, however, fans feel quite comfortable making and posting their own new versions of the opening title sequence, and there are currently dozens of videos out there! After reviewing all the ones I could find, I selected my TOP TWELVE. Yeah, I know it’s supposed to be TOP TEN, but I just couldn’t eliminate the final two. They were just so good! I’ve assembled those twelve fan-made videos here in one blog—ranked in order so that my favorite is last. Which one is YOUR favorite? Byron Man used VFX footage from the first nine episodes of Discovery to create a very nice opening montage. He included the names of more members of the cast and left out completely the parade of 147 producers, consulting producers, executive producers, co-executive producers, and janitorial staff that clutter up the existing opening credit sequence. Speaking of all of the producers listed in the opening credits, DrewVan Media felt that it might be less cluttered to just group all of those folks into just three of mega-listings and give more time to to the cast. And if you’re wondering if such a thing would ever happen in Hollywood today, the answer is: what planet do you live on??? Like the first alternative sequence (#12), Space Dave took some of the best VFX shots from the first nine episodes and put together a stunning montage over the Jeff Russo music. The reason Space Dave gets to sit four slots higher is because he added some Discovery sound effects to the music toward the end, and it’s a cool effect (like the USS Enterprise-D or Voyager warping away at the end of their opening title sequences). Dr. Zaius, in addition to being a talking orangutan and leading member of the Ape National Assembly, Minister of Science and also Chief Defender of the Faith, is apparently a Star Trek fan with a penchant for editing together montage sequences. This version takes VFX footage from the entire 15-episode first season of Discovery and combines it with the music from Star Trek: The Next Generation. And it’s not just the familiar Jerry Goldsmith theme that was used in the TNG series, but he also added the less familiar alternate theme that was composed by Dennis McCarthy and never used. The result is quite elegant and adds a really nice touch of showing each of the characters when the actors’ names are listed. No Trek series has ever done that before, but personally, I kinda like it! This is the final (and highest ranked) of the sequences that use the original version and simply change the music. In this case, Kris Taylor made a very interesting choice. In the third Netflix trailer for Discovery, they used Jetta’s modern cover of the 1971 rock classic “I’d Love To Change The World” by Ten Years After (here’s a link to the original). Kris decided to see how the haunting melody works under the Discovery title sequence. And frankly, I think it’s incredible! This next version begins with the same slow-tempo melody as the current Discovery theme. But then it jumps (and I do mean jumps!) 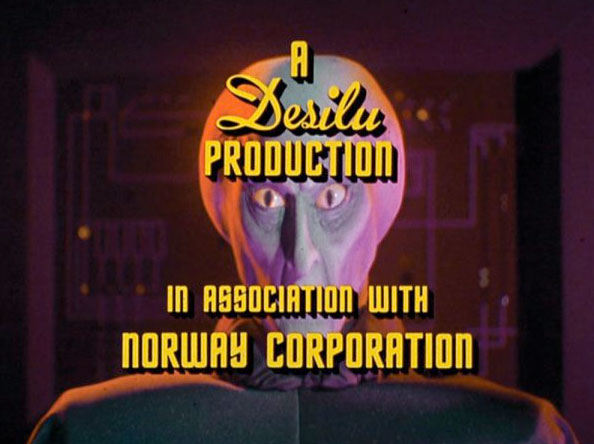 into the tense, hard-driving music used for the title sequence for the two-part “In A Mirror, Darkly” episodes of Star Trek: Enterprise. It turns out that music works even better for the fast-cut VFX from the first nine episodes of Discovery! Too bad CNCcamon1 didn’t have any footage from the four mirror universe episodes of Discovery when he edited this sequence, but even so, it’s pretty awesome to watch and really drives home the breakneck pace of most of season one. There’s even a cool mirror universe logo at the end…nicely done! There’s a couple of reasons that NicholsonD (a.k.a Dennis Alexander Nicholson) got the top spot from me. 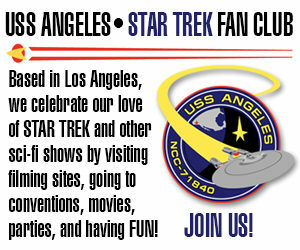 First, when it comes to Star Trek, I’m a traditionalist; I love what’s come before. And while I know that CBS wants Discovery to be fresh and different and stand on its own as a modern, cutting-edge Star Trek series, it was still a special feeling for me to see a title sequence done in the style of Deep Space Nine and Voyager. And second, as I said earlier, I’m in awe of people who can compose and produce their own original music. Dennis wrote “Trek Through The Stars” as an inspirational piece of music, and inspire it does…as Star Trek always should! Not bad…although I am still incredibly disappointed that Bryan Fuller isn’t in charge of the new Trek. Well, that starship sailed a LONG time ago, Doug. The new Klingons were a direct result of Fuller. He even wanted them to have CGI enhanced eyes. Some of these are excellent in terms of fan production values, but I have a huge problem with most. The ones that replace the visuals with actual Discovery visuals all highlight battle scenes, phaser fire, etc. Is that really what Star Trek has become? That is NOT what Star Trek is about. Not a single one of the openings of any Star Trek series (including the official Discovery opening) highlight battles – even DS9. TOS and TNG highlighted exploration in the dialog. DS9 highlighted the wormhole and new areas to explore. Voyager was great to show the ship in new areas, and Enterprise served to show mankind’s progress. To highlight phasers and battle sequences is so outside of what Star Trek should be about. Then again so is Discovery in the first place, so maybe it fits. I think the montages creators simply used what the show gave them to work with. There weren’t to many “quiet” shots of the Discovery. That by itself is a problem. 🙂 Discovery, good sci-fi show… terrible Star Trek. By the way Jonathan… Excellent recap on STC – great to reread all the articles again in one place. It does however show how little the quality of fan films have gone down since STC is gone. Not knocking the effort, but just nothing to capture a professional look and feel. All gone!!!! Thank you fan film guidelines. People who talk about the quality of Star Trek fan films and use STC as an example are promoting a fallacy. STC was always the exception, not the rule…as were Renegades and Axanar and, to an extent, New Voyages and Horizon. More “humble” Star Trek fan productions have always been more of the rule than the exception: Hidden Frontier, Dark Armada, Intrepid, Valiant, Farragut, Exeter, etc. And even more grass roots productions with even lower budgets—like everything from Potemkin Pictures, Tales of the Seventh Fleet, Antyllus, Natures Hunger, and many others–were always way more prolific than the professional-level productions. As far as I’m concerned. #5 is the best and most in keeping with the traditions of the Trek franchise. In defence of Discovery (did I really just write that?) I have to admit to quite liking the title sequence. OK, not quite all of it, I found the musical nod at the end of it to what had gone before to be a bit twee (particularly as the series itself flew in the face of what had gone before most of the time). But the music has its charms and, as an engineer, I quite liked the visuals for the most part. Not that I’m knocking the creative effort here either of course! Understand about fan film quality and that STC was an exception. That said, the majority of them today haven’t changed but there are no longer exceptions coming. I think Horizon and several others started to emerge as exceptions and they are no longer possible… so what we’re left with is lower quality solutions many of which, while labors of love that I appreciate, are really hard to watch. That might be true of some of them, but others are quite good. “Chance Encounter” is one of my favorites, and I’m really hoping their next effort, “The Holy Core,” gets funded, as well. DONATE NOW!!! I’m also looking forward to Deception II, Temporal Anomaly, and a new project based in the NX-01 era (not allowed to discuss that one yet!). Speaking of NX-era fan films, the ones from Aaron Vanderkley in Australia are all excellent and not difficult to watch at all. Are we going to get the six-figure Trek fan films anymore? Alas, most likely no (except for First Frontier and Pacific 201…both of which were in production before the guidelines). And who knows? Maybe another fan film will come along and blow us away. But as I said, the “giants” were always the exceptions rather than the rules. 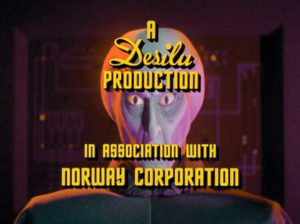 Although ST and NV did a combined two dozen episodes, and if you add in some of the others, maybe three dozen, there have always been ten times as many of the “little guys.” It was nice to hope that some productions could rival actual studio-produced Star Trek–and maybe even exceed it–but the closer that goal got to happening, the more likely CBS and Paramount were going to put their foot down. Had it not been Axanar, it would have been Renegades or Federation Rising, or maybe even STC or NV. As fun as it was, it wasn’t gonna go on forever. I ate too much cheese. I can appreciate you think that STC was an exception but I would have to disagree. STC was by far the best of the bunch, but New Voyages, Farragut, Exeter, Horizon, Hidden Frontier, Intrepid, and many others were very good. And there were many more coming that looked to be good – an example is Pike. All of those are now gone. Farragut was going to move to the movie era – gone. Pike is dead. The guidelines really have cut down anything above mediocre. What we are left with are things like Star Trek Lego. Great efforts and fun for fans but not what we were getting. Well, Exeter and Hidden Frontier were gone loooooong before the guidelines. I’m not really convinced Farragut Forward as ever going to happen (Starship Farragut’s final episode, “Homecoming,” was fully funded at the end of 2015; it’s nearly two and a half years later, and still no “Homecoming”). So I wouldn’t blame the guidelines for the demise of Starship Farragut. Horizon was a one-off, but yes, Tommy Kraft was planning Federation Rising. However, his Kickstarter goal was $250K, and I’m not sure he’d have reached it. As it was, STC only got to $199K during that same time period, and they had over half a dozen full-length episodes already. As for New Voyages, they had a number of problems over the years. I suspect that only “Torment of Destiny” would ever have been completed and that James Cawley already had one foot out the door before the lawsuit ever hit. David Gerrold had already moved on as show-runner, other key people were also gone…I’m not convinced we would have seen anything more from NV/P2 beyond “Torment of Destiny”…the guidelines were likely just a convenient excuse to do what James had probably wanted to do anyway. After all, STC released more episodes, so NV could have done the same (or at least released what they had) and then folded. But I suspect James was already in discussions with CBS licensing before the guidelines came out. Deals like that don’t happen overnight…or even in just three weeks (the time between the release of the guidelines and the announcement of the set tour. In the meantime, there is still some good stuff coming out. No, it’s not all at the level of Axanar or STC or Renegades or Horizon or NV, but those were still the exceptions. There’s always been way more of “the little guys”…and some of those productions–like “Chance Encounter,” the Arron Vanderkley stuff from Australia, and the upcoming “Temporal Anomaly”–are very much worth watching. Other great stuff like “Deception II”, a new NX-era series, and hopefully “The Holy Core” is/will be in development soon. Don’t lose faith. And remember that all of the “giants” of ST fan films are still out there for you to enjoy. Pretty sure the people behind Pike took the money and ran…didn’t even try to make it. If anyone deserves the vitrial that Axanar is getting it’s Pike. Previous Previous post: The complete HISTORY OF STAR TREK CONTINUES…in a single PDF! Next Next post: HOLY CORE, BATMAN! This TREK fan film KICKSTARTER has only 5 DAYS LEFT!